Everything had to be carried by hand at the steep new venue. That’s just how it goes at Red Bull Rampage. Katie Lozancich Photo. The tiny black helicopter I sit in lurches upwards and we ascend quickly. Trees become the size of matchsticks and the crowd flooding away from the 2018 Red Bull Rampage venue are an army of tiny figurines. The pilot points our attention towards the mountain that just hosted the event. “Do you see the start gate?” the pilot asks in my headset. I respond by shaking my head; nothing is discernible. In my field of vision, I only see sheer rocky spines expanding outward into the desert. Squinting, I spot a large run out from a jump. It was like a cascading domino effect; from that reference point, the lines carved by the riders start to reveal themselves. Excitedly, I play a game of Where’s Waldo and start to find the notable features from this year’s event. There’s the massive boulder near the beginning of Brendan Fairclough's line nicknamed “Dwayne Johnson” by his diggers, The helicopter swivels, and my newly trained eyes spot the 55-foot drop hit by Ethan Nell, Kurt Sorge, Adolf Silva, and Tom Van Steenbergen. That’s not even the tallest feature this year; the aptly-named Price is Right drop is 75 feet. From the ground, looking up, it was unnerving. Now gazing from above it only reinforces what’s at stake with this kind of riding. There’s no room for error. The competition venue from above; look closely and you can see the lines built into the spines. Katie Lozancich Photo. Two weeks ago none of this existed. 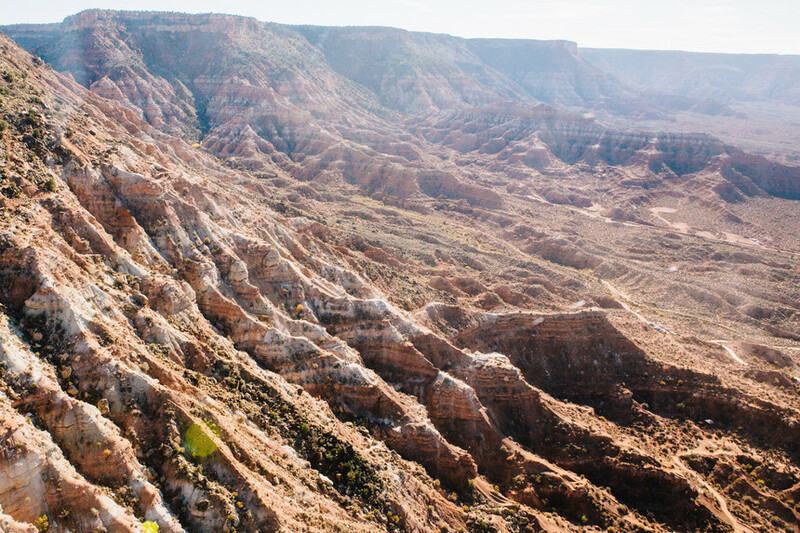 Instead, 21 riders and their dig crews arrived in Virgin, Utah to a completely blank canvas. This year the competition relocated its venue for the fifth time to what is by far the tallest and most daunting location yet. Todd Barber, who has managed Rampage since its inception, kept this spot in his back pocket for 11 years. They first scoped the zone when the competition was revitalized after its four-year hiatus between 2004 and 2008. Initially it was far too steep, so instead they directed their attention to across the valley to the 2008 site. Barber, however, never crossed it off the list. It was a waiting game for the technology to play catch up. Now that they’ve made it here, you can see the progression that’s led to this point. It’s a huge mountain, and had Red Bull gone straight here in 08’ it likely would have ended in failure. Take the 2008 course, which utilized wooden features. It was logical in hindsight. “We also didn’t have the forethought to say ‘Hey we need eight days to build’,” Barber explains. Those ramps are a stepping stone to where we are today. Now looking at the course from above, It’s a marvel what’s been done in eight days. “It’s a stand alone, one of kind event in all of extreme sports,” freeriding legend Darren Berrecloth explains, “You take something that mother nature created, and the goal is to interpret it.” With Rampage it’s easy to get absorbed by the massive aerials or exposed riding, but there’s much more to the showmanship. It’s also about craftsmanship. By the time of the event, they would build a network of trails comparable to the size of the Fitzsimmons section of the Whistler Bike Park. Interpreting the landscape is driven by each rider’s style and strengths. A slopestyle athlete like Thomas Genon is going to survey the landscape much differently than a veteran freerider like Cam Zink, but that’s the beauty of rampage: individuality is able to flourish. Once the riders interpret their surroundings, the next step is visualization. That’s one of trickiest aspects of the build; with no blueprint to work with, where you do you start? “It’s best to think of [their lines] as a jigsaw puzzle,” explains Justin Wyper, Brandon Semenuk’s digger for this years event. He’s no stranger to creating venues for the elite of the sport. For the past five years he’s built the Red Bull Joyride course at the Whistler Crankworx mountain bike festival. It’s like working in a sandbox compared to Rampage. With Joyride they’re fortunate to have a general blueprint to reference each year. Out here there’s no standard to start from, which is only exacerbated by the fact it’s all done by hand. In comparison he also points out that their tools were limited to essentially whatever you can carry with two hands. Shovels, pickaxes, rakes, and sandbags. This year, however, they scored the jackpot. A PVC coiled hose was installed from the base all the way to the top, pumping water straight to the diggers. An absolute luxury, they used to have to hike jugs of water up with them. “Back in the day we were so limited with how big we could go because the soil wouldn’t get hard enough,” Berrecloth explains. Without moisture this soil can be as finicky as moon dust, but add some water into the equation and they can pack their landings as hard as the jumps you’d find at Whistler’s Joyride. Tyler McCaul (above) and Brandon Semenuk (bottom left) in the process of building and testing their drops which neighboured each other. Katie Lozancich Photo. Often riders and diggers start the process by finding a particular feature as a genesis. It could be Dwayne Johnson, or Semenuk’s double drop. Once that feature is pinpointed, you begin adding the remaining pieces: start, middle, ending, and depending on the rider, a whole lot of aerials in between. Each piece is intentionally crafted so that your strengths as rider can shine through. But even with an articulated plan, things often shift based off the simplest logistics: how the trail feels. That rings particularly true at a new site. No one has worked out here, so everyone is experimenting. Adolf Silva charges over the 55-foot cliff drop—which wasn’t even the tallest drop at the event. Katie Lozancich Photo. The day before the final event I watch Semenuk survey his completed cornerstone: the double drop. His gaze is analytical. Silently he billygoats across the canyon to view the feature from another angle. Upon his return he reaches for a shovel and approaches the takeoff. With one swift stroke the dirt cracks around the shovel and crumbles downward. The lip too long, he decides, and proceeds to shave it down. It’s these last minute adjustments you simply can’t plan for. “You need to be able to use your eye and change things on the fly,” Berrecloth explains. He’s worked with engineers in the past to construct jumps and hated it, CAD drawings don’t compare to getting your hands dirty on the trail. Experience, at the end of the day, is what matters most out here. The builds are examples of problem solving constantly at work. It’s not uncommon in this terrain to be deceived by the dirt. Sometimes lurking underneath is the last thing you’d like to find: unforgiving rock. That’s at least what happened to this year’s winner Brett Rheeder and his dig team. For five days straight, diggers Matt MacDuff and Ben Byers had to clear away the rocks from the run out of a jump. That’s just one landing for an entire line. From sunup to sundown, they chipped, chipped, and chipped. Then, the next day, they did it all over again. During the initial line scout, most of the riders deviated to looker’s right. Rheeder was drawn to the left. It paid off. In the seven years that he’s competed, this was the first year he had his own zone. Boldly, it cut straight down the mountain. It stands out when you look at it, we knew [that line] was going to be a lot of work, but it was ultimately possible — Matt MacDuff. But before anyone started moving dirt the factors were in nobody’s favor. Even though the venue increased in height, they had the same amount of days and diggers. Tacking on an extra 150 feet doesn’t sound like much, that is until you’re moving dirt. 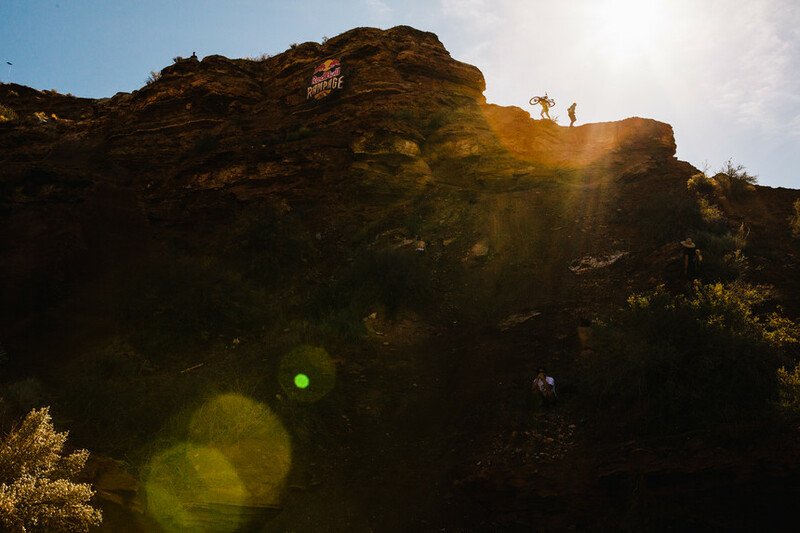 After hours of work in the sun, it only took one run for Rheeder to become the Red Bull Rampage Champion. Katie Lozancich Photo. Right away, his team focused their attention on the hardest elements of his line, which also had the least malleable rock. 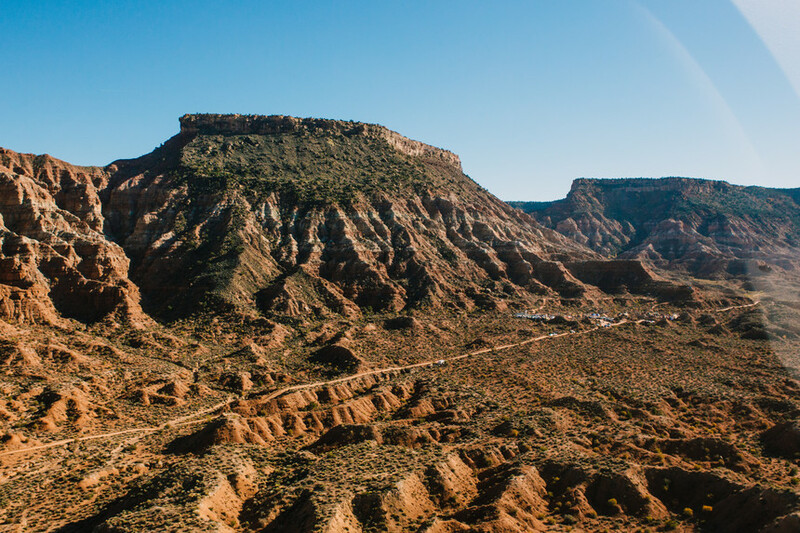 The white rock, extremely tough and infamous to Southern Utah, was near all of Rheeder’s major drops. By competition day, they had picked through at least six feet of it. Choosing to divide and conquer, Brett joined the other teams to finish the shared sections in his zone. Even then they were still cutting it close. A rain day halted everything, thus unexpectedly eliminating one of their much-needed work days. “There were a lot of question marks when we were building like, ‘are we going to get the line done?’ or more importantly ‘is it going to actually work?’” Rheeder says. The builds were so big that they couldn’t help but operate behind schedule. The mountain, which will wait quietly until next year's competition. Katie Lozancich Photo. The new venue site shrinks in size as the helicopter turns and flies towards the South. We glide over the tops of the adjacent mountains. As we pass, I notice faint lines woven along the ridges. Weathered from both time and the harsh elements of the desert, these trails eventually connect to old run outs and drops. They’re the artifacts of previous rampage sites. In fact, some of them are still rideable, most infamously the trails located on Kolob Terrace road at the very first venue. But for this year’s course it has been wiped clean. To keep people from riding the new venue, Red Bull has destroyed the jumps and run outs, ultimately erasing hours of meticulous hard work. If the venue doesn’t move, next year the athletes will return to same mountain but with a brand new canvas to interpret.